This rolling, reversible snack cart offers a choice of play menus! With the "Hot Dogs" menu and awning on display, kids can reach inside the sliding see-through doors to serve up a hot dog with toppings to order, a soft pretzel with mustard or salt, and more. Flip the awning and menu to "Ice Cream" and reverse the storage drawers, and reach in for cones, scoops, and pull-apart pops for dessert! The sturdy wooden cart comes stocked with over 40 play pieces, so kids can make and serve everything on the double-sided, writable menu. This inventive cart lets kids create countless imaginative snacks and deserts from start to finish! 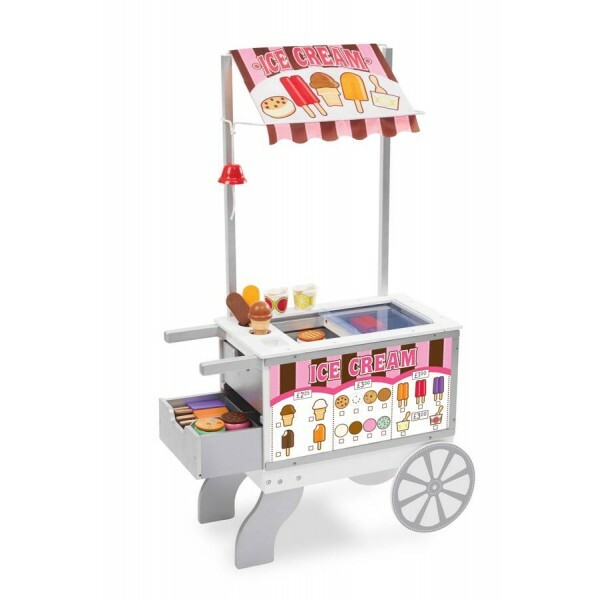 With over 40 pieces the cart includes everything your child needs in order to make a range of different food items.